For those interested in the economy, by which I mean business, government economic policies, people’s work and their material well-being, the past few decades have been interesting times. 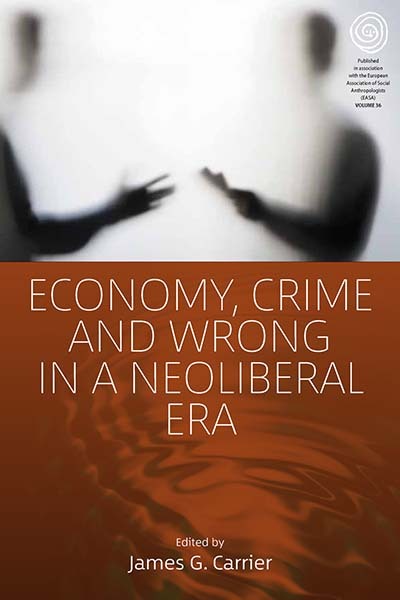 Economy, Crime and Wrong in a Neoliberal Era is the result of trying to make sense of things. Those times began with the Great Moderation of the 1990s, when economic stability and rising markets seemed to vindicate the neoliberal and neoclassical policies, and the embrace of free and expanding markets, that marked the rejection of the older Keynesian political economy. They continued with the dot-com boom and bust of the late 1990s, the financial crisis of 2007–08 and the Great Recession and waves of government austerity that followed. Throughout this period people were told that they should innovate to realise their desires. That is, they were told that they should think of new things to do or of new ways of doing things, though for different reasons at different times. During booms and bubbles, innovation was presented as the route to wealth, exemplified by famous entrepreneurs and the businesses that they set up. During bad times, innovation was presented as the way to survive, and those who feared for their future were told that they need to present themselves in new and different ways to attract attention in a competitive economy. For different reasons in different times, then, people were told that they should ignore the conventional expectations about normal behaviour that lots of people took for granted. The result was that some people’s imaginative innovation turned out to be other people’s deception and immorality. What are we to make of this? Did we simply confront a set of people who were unable to tell the difference between right and wrong? There are such people, but this seems inadequate to account for what appears to be the industrial level of heedless and sharp practices, even fraud and deception, that were shown to exist especially in the American financial sector during the housing bubble that preceded the Great Recession. A more systemic approach seems necessary. That systemic approach raises questions of its own. Were we seeing the irrational exuberance that Alan Greenspan had warned us against, the sort of normlessness that Durkheim said can emerge not only when times are very bad but also when times are very good and everything seems possible? Alternatively, were we seeing the consequences of the growth of the financial sector and its globalisation that followed from the liberalisation of banks and markets, especially in the 1980s? Were these changes accompanied by more subtle changes in the ways that people thought about, or were encouraged to think about, themselves and their actions and the good life? More depressing, had this being going on for a long time and we simply had not noticed it before? These questions have no simple answers, but the contributors to this volume help us to get a sense of what has been going in different sectors of the economy and with what effects. Above all, they show that right and wrong seem to be a matter of context, in several ways. For instance, they show that those in some economic sectors see as normal and justified the sort of activities that most people probably would see as unwise or even wrong. That is because individual firms and employees in those sectors would not survive, much less prosper, if they did not adopt them. They show that when political and economic circumstances change, people can come to see as acceptable activities that are against the law or can come to see as criminal what had been acceptable for decades. Equally, of course, those changing circumstances can create opportunities for some people to engage in innovative activities that are acceptable until authorities declare them otherwise, and for other people to present authorities with financial affairs that are so complex that what look like rules become matters for negotiation. The rules, then, are less solid than they seemed, and ethical and professional judgement can come be replaced by a concern with things like customer satisfaction and market success. Popularity, then, replaces morality and standards. But though the changing political and economic circumstances of the past few decades may have revealed the fragile nature of the rules, those rules may have been fragile for a long time without us noticing. Perhaps, then, we need to pay more attention to the creation and nature of formal and informal rules. Perhaps, that is, we should look not just at rule breaking but also at the things that are broken. As I said, the papers in this volume offer no simple answers. Instead, they raise questions that are important for those concerned with economic wrongdoing. James G. Carrier is Associate at the Max Planck Institute for Social Anthropology, and Adjunct Professor of Anthropology at Indiana University. His publications on economy and society include Gifts and Commodities: Exchange and Western Capitalism Since 1700(Routledge, 1995), Meanings of the Market (Berg, 1997, ed. ), Ethical Consumption: Social Value and Economic Practice (Berghahn, 2012, ed. with P. Luetchford) and Anthropologies of Class (Cambridge, 2015, ed. with D. Kalb).